The team are pleased to announce One Call for All won Regional Award Winner for Best Engineering Achievement at the 2016/2017 Marshalls Landscape Awards. This year’s national awards attracted strong competition across multiple categories registering 600 independent installers and 700 projects from around the country to showcase the best of British design. Managing Director Mark Hinkley said "It is such an honour to accept this award. It’s an incredible achievement for the whole team and I am immensely proud. 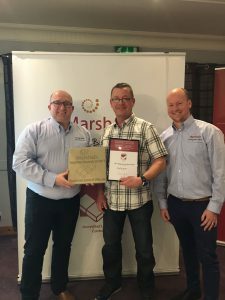 Winning against such strong competition is remarkable and I would like to extend my thanks to Marshalls for their continued support and recognition." Rope Garden Nursery did a brilliant job redesigning our patio and driveway back in 2014. Mark came up with some amazing designs, all costs were explained and agreed up front, we paid a deposit and the final invoice after all work had been completed. Every member of the team was friendly, polite and very hard working. Unfortunately, a few months later we had a few issues that we weren't completely satisfied with including a drainage problem and settlement on the block drive. I contacted Mark and all issues were rectified to a very high standard at no additional cost to us. As a result of their professionalism we booked them again in February this year to landscape our sloping and soggy back garden. Again, the team were friendly and hardworking and we now have a lovely useable split level garden. I can’t praise the team enough for the work they did for me. I’m signing up for more! Oh yes, I was living on an island before Mark and his team showed up. Water absolutely everywhere the flooding was ridiculous. Believe me I’ve had plenty of bad experiences with traders so it’s been a revelation to find a good one who does quality work. The team I had were so polite, respectful, and tidied up after each day. Big ticks in my book. Mark’s landscape designs are inspiring if you want to stand out from the crowd. If you get dreamy watching ‘Love Your Garden’ like me with Alan Tichmarsh then without a doubt this is the team for you. My garden is now my beautiful sanctuary, I love it!! P.S Mark, Congratulations - a winner at the Marshalls landscaping 2017 Awards this year. Well-deserved team!